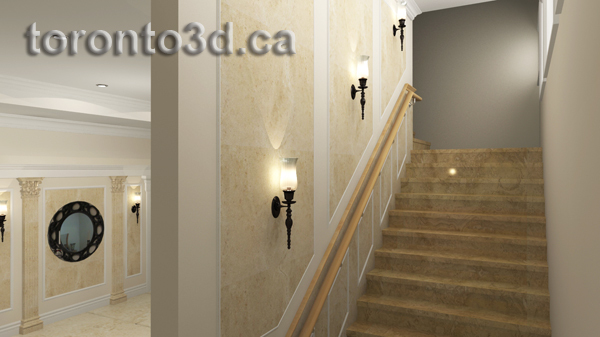 This basement interior design project was carried out in a classic house. Construction of the house has already been completed by Rykoff Design & Build. Owner of the house wanted to see it through and make the interior of the basement in spacious interior style of the house. He wanted the basement would be very light and would not give the impression of limited space. Because the windows in the basement are too small, it was decided to place light boxes in the game room to make an impression of larger windows. Landscape, which is printed on light boxes, creates the illusion of nature outside the window and expands the space. Thus playroom in the basement turned into a summer house in the fresh air. The huge walls were divided for a few sections by moldings, just like the classic style requires. The frescoes on the walls added elegance and richness to the interior.